Treatment of upper and/or lower eyelids has traditionally been with a Blepharoplasty. This is a procedure that involves the removal of any excess skin, along with some fat and possibly eyelid muscle. For example, the “bags” under our eyes were considered a result of the downward movement of fat, skin and soft tissue. The mainstay of treatment has been the removal of fat from these “bags”. However this type of procedure often results in a sunken, hollowed out appearance of the lower eyelid area. We now know that a significant contributor to the appearance of these ‘bags’ is a loss of fat in this area. Because of this, in some patients consideration should also be given to adding some fat to this area via fat transfer (see below ). 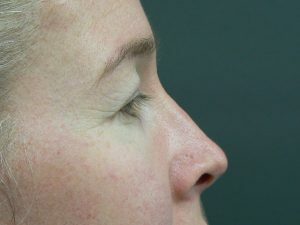 IS BLEPHAROPLASTY OR FAT TRANSFER BEST? Upper Eyelid– The main problem here is usually excess, loose skin and so a simple blepharoplasty is usually sufficient. Lower Eyelids–As we all age we tend to lose fat from our face. The best approach to the ageing lower eyelid is more likely to include both a blepharoplasty and replacement of fat into this area (i.e. fat transfer). 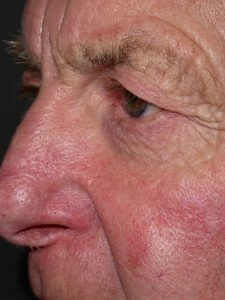 Cheeks and Temporal Areas– With age these areas also tend to lose fat and “hollow out”. Fat transfer to these areas is also very good at restoring a more youthful appearance to the face. Dr Bellaney has been performing blepharoplasties for over 10 years. He has now moved away from always performing a simple blepharoplasty and tailors the best treatment to each patient’s needs. In some patients a traditional blepharoplasty alone is sufficient whereas in others a combination of fat transfer and a blepharoplasty may be the best to obtain optimum results. Common side effects are bruising and swelling, particularly when the lower eyelids are treated. This can last up to a week or 10 days. Pain is usually mild to moderate post-operatively and easily managed with oral pain relief. Elevate the head for several days and don’t bend down with their heads below their hips. Use antibiotic eye drops or oral antibiotics for a week as directed. There is often some swelling and bruising associated with the procedure which resolves over the ensuing week. The eyelids can be stiff and sore for up to several weeks. Patients cannot wear contact lenses for up to 2 weeks following the procedure as they may irritate the eyes. In most cases, make-up can be worn after about 1-2 days. Eyelid surgery is a surgical procedure and the body has to heal before the full benefits can be seen – this will take up to several months. 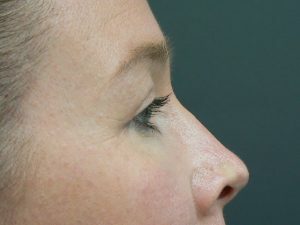 For most people, this procedure takes years off the appearance of their face. After this procedure patients have a softer, more fresh and youthful look to their eye area. If you have been wondering how to get rid of your tired saggy eyelids and would like additional information, we would be happy to schedule a consultation. Fat transfer or Autologous Fat Transfer (AFT) is the process by which a patient’s own fat is removed from one area (usually the abdomen, flanks or buttock), processed and placed into facial areas of concern to the patient, most commonly the lower eyelid, cheek, eyebrow and temporal areas. Fat transfer will restore the “fullness” of the treated area that is usual in younger faces. AFT requires the establishment of blood supply to the transferred fat in order for the fat to become permanent. Fortunately in the area below the eye, most of the fat injected remains permanent and so only 1 – 2 treatments are generally required. In other areas often only 20 – 30% of the fat transferred remains permanent, so 4 -5 procedures may be required for the ultimate effect in these areas. Side Effects of Fat transfer. 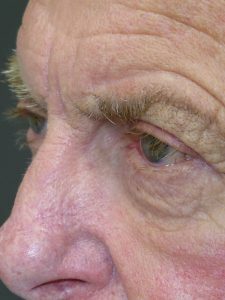 As with Blepharoplasty, common side effects are bruising and swelling, particularly when the lower eyelids are treated. This can last up to a week or 10 days. Pain is usually mild to moderate post-operatively and easily managed with oral pain relief. Extremely rare side effects of fat transfer include inadvertent injection into a blood vessel leading to the eye with rare reports of blindness in one eye occurring. These events have tended to occur in association with the use of a sharp injecting needles. We use blunt tipped cannulas rather than needles and along with current injection techniques this should eliminate this problem. If you’ve been wondering how to get rid of your tired saggy eyelids and would like additional information, we would be happy to schedule a consultation.